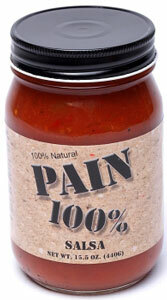 Pain 100% Pain Salsa is a delightfully painful experience. Kick up any fiesta with this 100% natural salsa. 15.5oz. Tomatoes (tomatoes, tomato juice, citric acid, calcium chloride), water, habanero peppers, tomato paste, green chiles (green chiles, salt, citric acid), jalapeno peppers, spices, salt, garlic powder, onion powder, olive oil, black pepper and distilled vinegar.